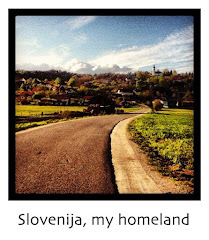 This week I am on a short trip to my home country, Slovenia, visiting my parents. I wish you all a wonderful and creative week and will see you next week when I also reopen my Etsy shop. 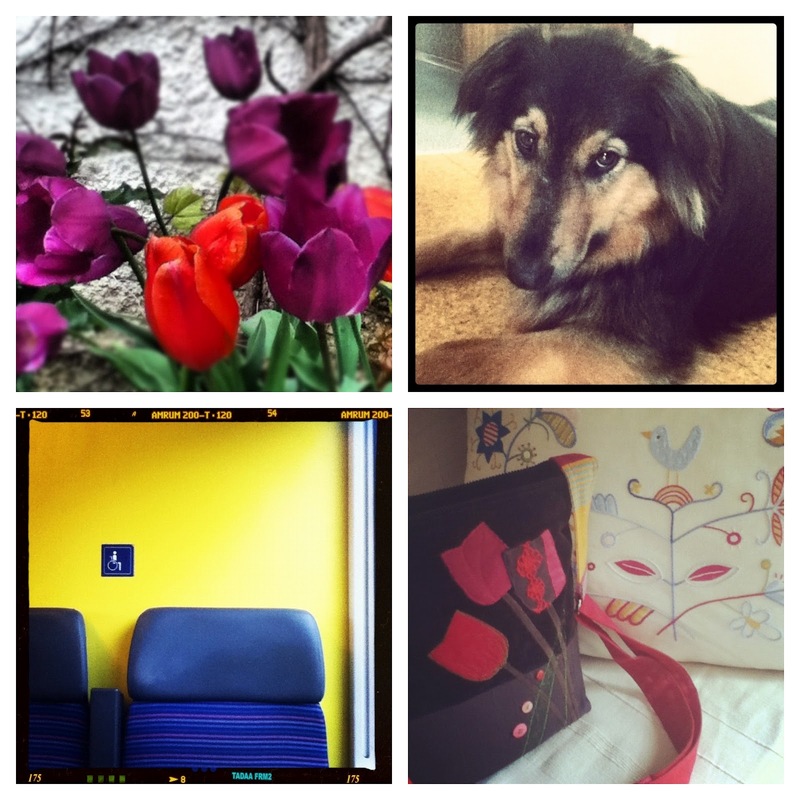 My mom's tulips, my parents's dog Miško, who used to be quite a handful but is now the star of dog obedience school, my new tulip messenger that proved to be an excellent traveling companion, and a snapshot from the train ride. 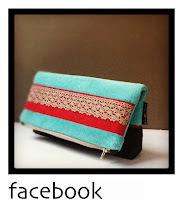 Yesterday I introduced a brand new design to my shop, a fold over zippered clutch for everyday, formal and special occasions. The clutch is 26 cm tall, 13 cm if folded in hald, and 24 cm wide at the top with 20 cm zipper. 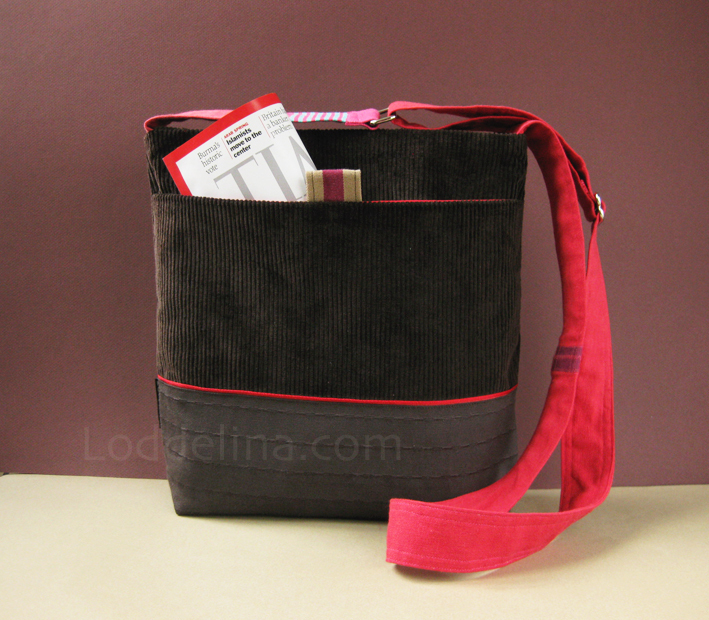 Sturdy fusible interfacing makes this purse keep its shape and generous, 5 cm wide bottom makes it roomy enough for all your essentials. 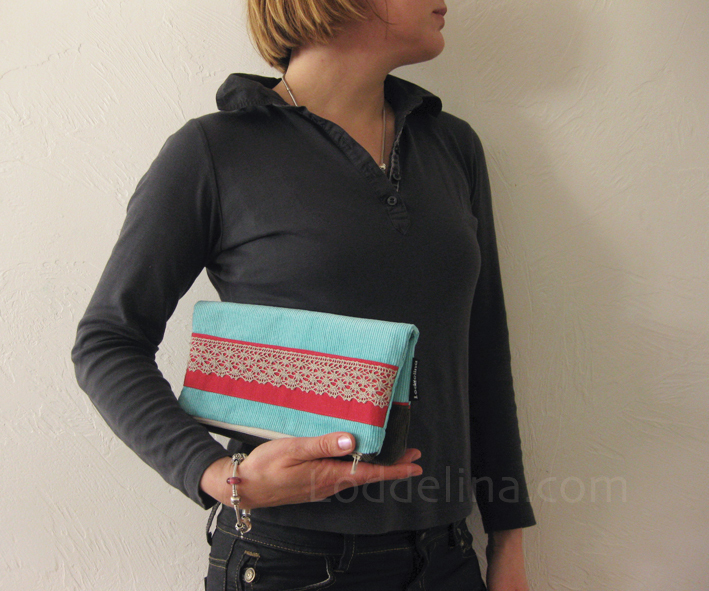 First clutch is made from soft cotton corduroy in vibrant robin's egg blue, paired with dark olive green corduroy and a patch in bright red canvas, decorated with linen lace trim. Perfect for wearing with jeans or a colourful dress. 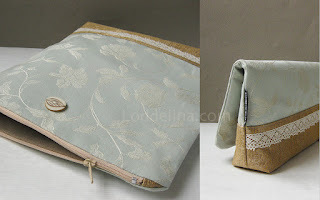 Second one, made from pale aqua floral jacquard and golden mustard upholstery fabric is more formal, for an evening out or ven for a wedding day. It is decorated with a delicate cream lace trim and etched button. I just listed a new bag in my shop, a medium to large messenger shoulder bag in dark chocolate corduroy, decorated with tulip applique and embroidery in pink, red and purple. 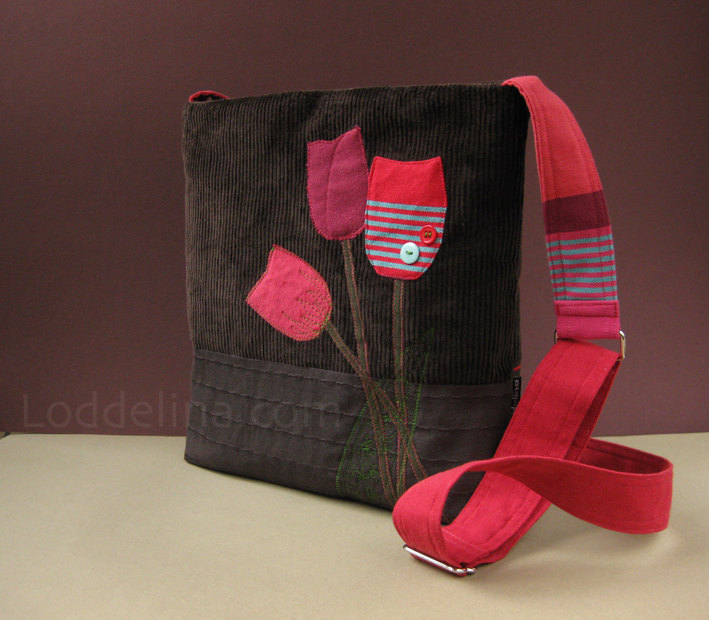 Bag is fully lined with red canvas and has a large pocket in the back that closes with a magnetic snap. 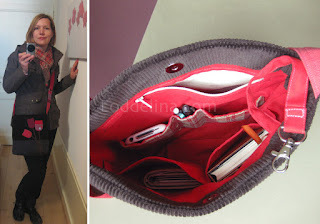 Adjustable shoulder strap is made from cherry red canvas and a patch of striped canvas and the bag has five interior pockets for all your essentials, like phone, pencils, sunglasses and tissues + a swivel hook for your keys. I made another bag very similar to this one for myself and have been happily carrying it around for a few days - I use my swivel hook to attach a reusable canvas shopping bag and I slip my keys in the back pocket which can also hold a newspaper or a small package I need to take to the post office. Other pockets hold my mobile phone, my iPod, a bag of paper tissues, my wallet and pens. 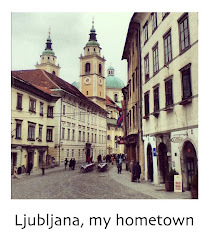 Plus there is plenty of room for a small sketch book, sunglasses, a small scarf for sudden chilly wind (very common on this high altitude) and a makeup pouch. What else does a girl need?